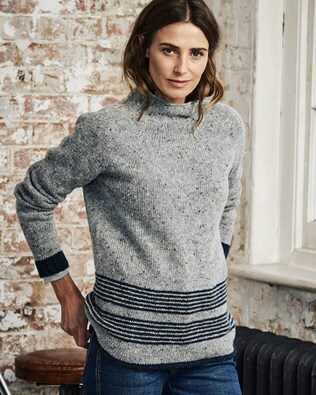 Shop our online range of ladies knitwear from Celtic & Co and wrap up warm in stylish knitted dresses, super-soft lambswool jumpers and fine-knit cardigans, made in Great Britain. Choose from ladies chunky knitwear to keep off the chill during the colder days of the year, sophisticated fine-knit cardigans that look gorgeous with knee high boots and wardrobe essential jumper dresses that you can throw on over a pair of leggings and ankle boots. 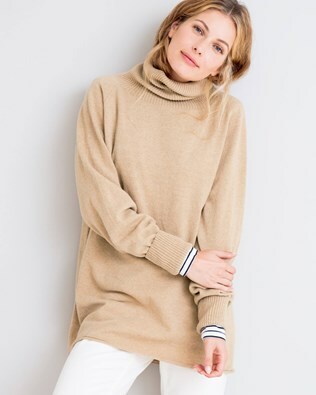 Fall in love with our collection of irresistibly soft merino lambswool roll neck jumpers and dresses and pair with your favourite pure sheepskin boots from Celtic & Co for the ultimate cosy outfit. Whether you’re searching for the perfect look for a UK or European weekend break or you’re looking for something comfortable and of high-quality to keep you warm all year round, our ladies knitwear range will help you to find a beautiful outfit that features the finest quality of Merino, Geelong, Donegal lambswool, alpaca wool and cotton. 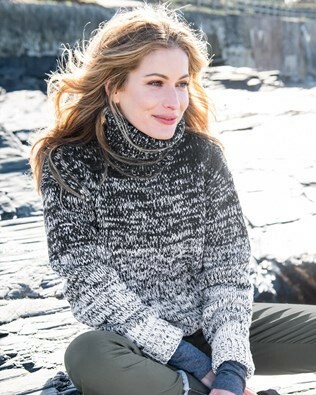 Thanks to our online range of ladies knitwear, we’ll take care of the cosy and comfortable outfits, so that you can focus on relaxing in front of a crackling fire or exploring the great outdoors. Shop our ladies knitwear collection now.